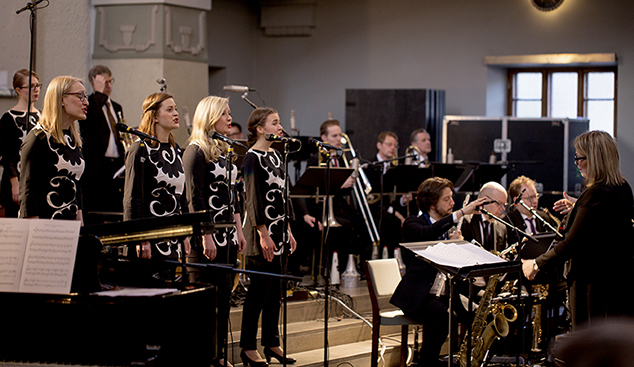 UMO Jazz Orchestra, the big band pride of Finland, and KYN who ranks sixth in the list of the best female choirs of the world continue their collaboration with two concerts in the week of All Saints’ Day. Last time these two met something completely new came into being. UMO and KYN have compiled a new programme for the special atmosphere of All Saints’ Day including music from the likes of Anna-Mari Kähärä and Kaj Chydenius. The new arrangements written by Mikko Hassinen of pieces like “Aamulla varhain” and “Sinua, sinua rakastan” tune us in for memories, remembrance and longing. KYN is an ambitious reformer of choir music. Finnish leading newspaper Helsingin Sanomat has accoladed KYN as one of the brightest stars in the Finnish choir sky and a trailblazer of jazz music. Some recent feathers KYN has collected in its cap include winning a Grand Prix prize and a special award for Outstanding Stage Performance in Berlin, and being selected as Choir of the Year. In March 2018, KYN released its ninth album, Outo kantele (Strange Kantele). UMO is conducted by Kirmo Lintinen, KYN by Kaija Viitasalo.